In honor of Women's History Month, the Chicago Department of Cultural Affairs hosted a discussion panel of women business owners at the Chicago Downtown Farmstand last night. 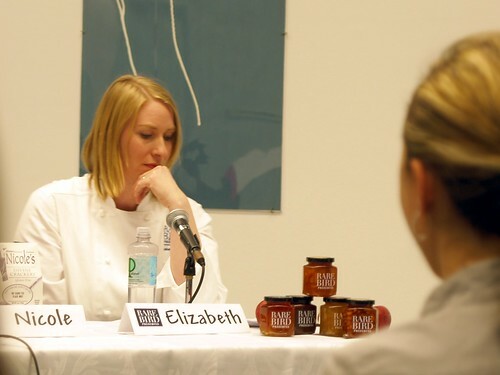 These purveyors of local products spoke about how they started their businesses and their experiences as women business owners in the Chicago area. Nicole Bergere started her bakery 25 years ago after working in costume and clothing design. Her first loaves were baked in Rogers Park, and with the help of her friend "Little Grace," she soon landed her first big account -- Neiman Marcus. Bergere's company now produces crackers, breads, sweets and sauces for an international market and supplies some of Chicago's top hotels like the Four Seasons, Trump Towers and the Peninsula. She cautioned artisanal business owners seeking to expand to oversee everything and to be careful not to grow too quickly. "There's nothing like having your own business," said Bergere, who is now in her eighties. "All the headaches and all the awards" are yours. "If you believe in yourself, you'll be a success." 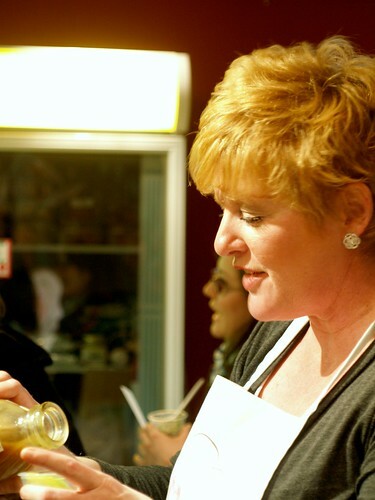 Pigtale Twist dressings and sauces grew out of Meg Dhamer's catering business. 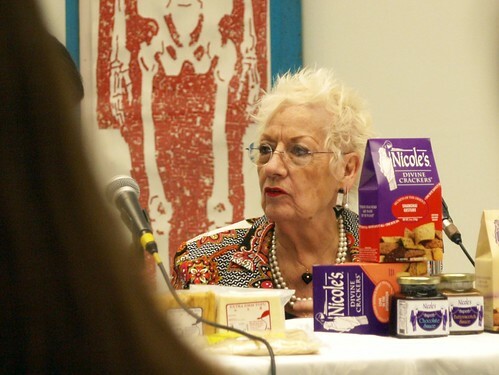 After raising two children and going through a divorce, Dhamer decided to enroll in a food writing course with instructor Alan Richman at the French Culinary Institute in New York. When a writing project covering pet shops took her to Lamb's Farm in Libertyville, she knew she had found the perfect place to contract with to produce dressings and sauces from her recipes. Dhamer uses Oberweis dairy products and local ingredients whenever possible and her products are now carried in 35 stores in the midwest. When she was thinking of starting her business, Dhamer attended seminars and fancy food shows through the NASFT to learn more about the specialty food industry and increase her confidence as a producer. Dhamer was warned that people in the food industry would not share information when she was starting out. However, in her experience people in the industry are very helpful and she encouraged other entrepreneurs not to be afraid to ask questions. Elizabeth Madden earned bachelor's and master's degrees in fine art before studying at the French Pastry School in Chicago. The single day that the program spent on jams was a revelatory experience for Madden who appreciated the art in using simple ingredients to preserve and support the natural flavors of fruit. After school, Madden worked at Trotter's To Go and credits the experience with setting her high standards for ingredients. Madden works directly with local farmers to obtain fruit within hours of picking for her products. She makes her own pectin from natural ingredients and pairs seasonal fruit with subtle flavors from tea, wine and chocolate to create her unique jams. Madden recommended that entrepreneurs network with other small businesses to learn about the industry and establish their business. Jessica Volpe spent a semester in Rome as a college student at Loyola where she experienced fresh pasta for the first time. After spending time as a freelance writer back in Chicago, Volpe enrolled in the Cooking and Hospitality Institute. She worked in a restaurant after graduating and liked making pasta there, but didn't like working the line. 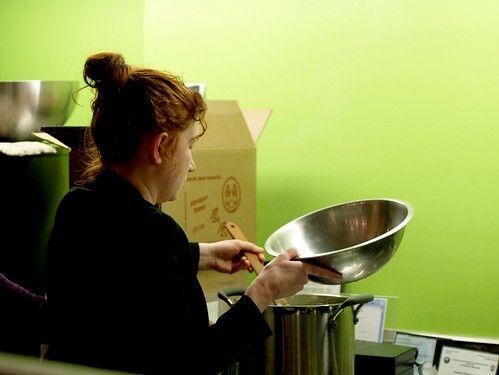 She began her business of organic handmade pasta using locally sourced ingredients two years ago this summer. Volpe wrote a 50 page business plan before launching Pasta Puttana and has followed it almost to the letter. She encouraged other entrepreneurs to do the same. Jenny Yang was born in Taiwan and earned her MBA at Northwestern-Kellogg. After several years of balancing family and a demanding schedule as the Business Manager for Sara Lee, Yang decided to purchase the 20 year-old Phoenix Bean tofu company near her home in Andersonville from the owner who was retiring. Yang and her family had been purchasing Phoenix Bean products for years and believed in the company. 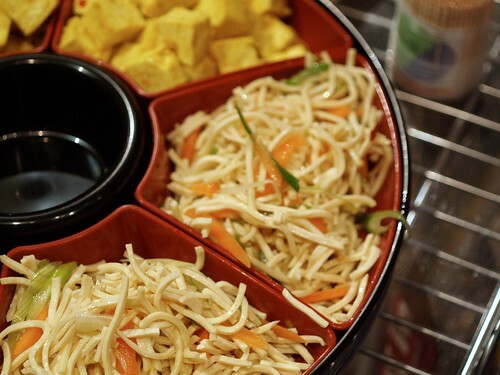 The preservative-free tofu had long been popular in the Chinese community and, after market research, Yang decided to try to take the product to the larger Chicago community. Yang's first major project as owner was to improve product quality by visiting Ohio soybean farms to find farmers who could provide her company with higher-quality ingredients. She is currently in the process of updating the production facility. She advised entrepreneurs to take stock of their talents and experience and build on it for their future. 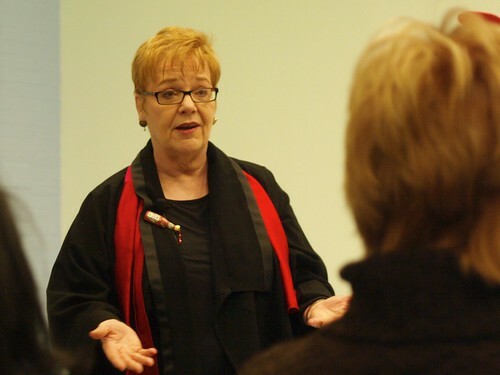 Judith Dunbar Hines, director of culinary arts and events for the city's Department of Cultural Affairs, offered the services of her office to Chicagoans interested in starting their own food related businesses. They can help entrepreneurs navigate legal and licensing regulations and connect them with other resources. Products from these vendors and other local businesses are available at Chicago's Downtown Farmstand, located at 66 E. Randolph. Love your product. Met you once at Sendiks in Mequon, Wisconsin. Do you know Chef JOhn from Foodwishes.com?